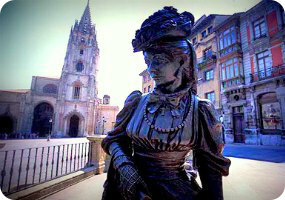 Book now the best shore excursions in Gijón and Oviedo. High quality and safety at the lowest prices. If your are looking for the best Shore Excursion Gijón and Oviedo, book now the best guided tours at lowest price with Ancora Tours. Since 2003 we offer you official guides in english, transportation and travel insurance, all included. The highest quality at the lowest rates. This shore excursion in Gijon and Oviedo takes you to the Principality of Asturias in northern Spain. While Gijón was founded by the Romans and remarkably culturally rich, Oviedo has various monuments ranked in the UNESCO World Heritage list. What’s eating: Fabada Asturiana, a rich stew made with large white beans; pork shoulder (lacuna); morcilla (black pudding); chorizo salami. Our Gijón shore excursion will first drive from port to the city of Oviedo, where we can explore Baroque buildings and medieval churches. First, we’ll visit the gothic Cathedral of San Salvador which is home to the Sudarium of Oviedo. This bloodstained cloth is said to have been wrapped around the head of Christ after his death. Our next stop is San Julián de los Prados, a ninth century church and UNESCO World Heritage Site. Before we leave Oviedo we’ll see the Foncalada, a Pre-Romanesque style public water fountain which is over 1000 years old. The shore excursion returns to Gijón, where we will visit the old town Cimadevilla. This headland separates the two main beaches of San Lorenzo and Poniente. In the old town we’ll visit the main square, Plaza Mayor, where the graceful Town Hall building is located. To conclude the Gijón shore excursion we’ll head to the Hill of Santa Catalina where we’ll admire the bold sculpture In Praise of the Horizon. Created by Eduardo Chillida this abstract piece is made from reinforced concrete and weighs 500 tons. At the end of the shore excursion, we will come back to port by bus for boarding.